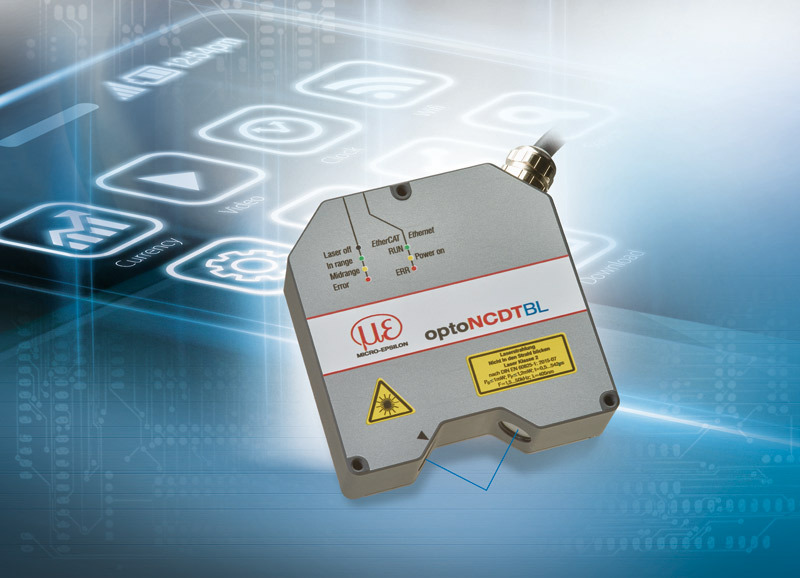 The new optoNCDT 2300-2DR uses blue laser light and is specially designed for displacement and distance measurements on directly reflecting surfaces. On reflective and shiny surfaces, the sensor operates at high speed and provides maximum precision in the nanometer range. In addition, the sensor stands out due to its unique compactness. The optoNCDT 2300-2DR laser sensor is especially suitable for reflective and shiny targets. The sensor is for example used in thickness measurements of flat glass, distance measurements on annealed glass and assembly monitoring of extremely small parts. The measuring rate can be set up to 49kHz which is why the sensor is ideally suitable for process monitoring tasks. While operating with the Advanced Real-Time-Surface-Compensation (A-RTSC), the sensor enables a precise real-time surface compensation of different surface types. Data output is via Ethernet, RS422 or EtherCAT. If the sensor is operated with the CSP2008 universal controller, an analog output is available and the measurement values of material thickness and width can be synchronously acquired and evaluated. The sensor is based on a parallel installation to the measurement object. The blue laser light is directly reflected onto the receiving optics by the measurement object. Unlike red laser light, the blue laser light does not penetrate the measurement object. A sharp point is projected onto the surface, which enables a stable signal on the receiver element. Therefore, the sensor is able to measure to nanometer resolution. In addition, the extremely small laser spot size allows the sensor to detect very small objects. In addition to its high precision sensor technology, the size of the sensor makes the new optoNCDT 2300-2DR unique. In this sensor class, it is the only laser sensor worldwide whose entire electronics is integrated in a compact housing. The optoNCDT 2300-2DR sensor is based on the principle of optical triangulation. A visible, modulated light spot is projected onto the target surface. The receiving optics produces the direct proportion of the light spot, in dependency of the distance, onto a CCD element with spatial resolution. A digital signal processer in the sensor calculates the distances between the light spot on the target and the sensor from the output signal of the CCD element. The distance value is linearized and output via an analog or digital interface.